LOVELY THREE ROOM APARTMENT FOR YOUR STAY IN THIS GREAT COLLEGE TOWN OF AMHERST! Newly renovated second floor, three room apartment in owner-occupied home. Central location and short drive to many area amenities including: the Town Center; Bike trails; Holyoke Range hiking; Amethyst Brook for nature walks; UMass; Amherst College; Hampshire College; Shopping in Amherst and Northampton; Great selection of restaurants; and more! A very short walk to various quick food options including Dunkin Donuts; Subway; Pizza/Calzones; Breakfast/Lunch restaurant; Chinese food; ATMs; and convenient stores. A great space for someone looking for a solo retreat in a safe, respectful home. Great too for a couple looking to enjoy some time away. A relaxing space for parents coming to Amherst to visit their children attending one of the local colleges. The home is a 1782 Colonial and consists of three apartments. Owner lives on first floor and there are two apartments on second floor. The other apartment is currently under an annual lease to a UMass doctoral student who is very nice and quiet. The bedroom is large with a new, very comfy Queen bed, two relaxing chairs, cable TV, window AC (in season) and WIFI. A small den area has a dining table for two, a swivel chair for reading and some shelves for guests belongings. The kitchen galley has a gas stove, refrigerator, microwave, toaster, and cupboards are stocked with dishes, silverware, glasses, pots, etc. The bathroom has a small shower and lots of shelving. There is a front and back private entrance to the apartment. Guests may use the front porch for their pleasure (seasonal). There is off street parking in the back of home. The owner is a psychotherapist who works full-time in Springfield, MA., yet available in the mornings, evenings and weekends to support your various needs during your stay or by cell phone at anytime. The home is on the bus route which has very frequent runs during the academic year. It is a mixed neighborhood of owner-occupied and student rentals as is much of this college town. The rate is $125/night. Special weekly rate of $750.! The owner is friendly, open and caring and would be most interested and welcoming to guests with similar traits :) Looking forward to your visit/holiday! No tub--Small shower stall. See pictures. See photos. Gas stove. Refrigerator. Microwave, Toaster, cupboards stocked with dishes, glasses, silverware, pots, pans, etc. Hampshire Fitness Health Club is minutes away. Daily passes available at reasonable rates. Club includes multiple workout rooms, large pool, hot tub and sauna. This rental is for the use of booked guests only and is not for entertaining or to include any added persons. Melanie was a wonderful hostess and the location was central to everything we needed! Great location for the five colleges and a short walk or drive to Amherst! Clean and comfortable. Melanie communicated well and provided us great tips for being a part of the community! Great little apartment, perfect for my weekend or a longer stay. Apartment was very clean, great ambiance in the bedroom with wide-planked wood floors. Parking was easy. Owner was just lovely, great experience overall! Nice spot! Attentive, friendly owner. Everything you need in a small, well-appointed place. Enjoyable - and only a mile or so from the center of town. 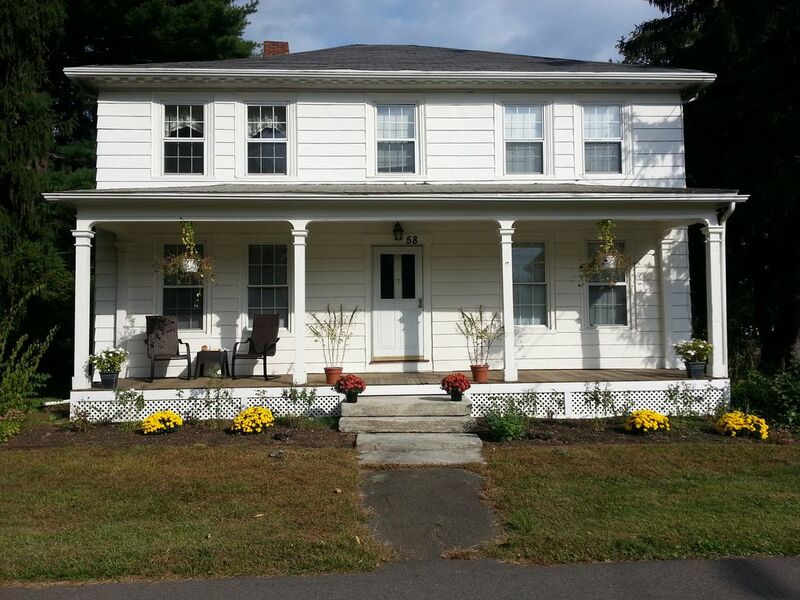 Well-appointed, with all desired amenities, this comfortable 2nd floor apartment and the home in which it’s situated have the right “New England” feel for a multiple night visit in Amherst. Highly recommended. No pets; however, owner has one cat living on first floor. No smoking.